De grote tuin (24. 000 mq), de tennisbaan en het zwembad met complete keuken, terras met barbecue en 2 kleedkamers met douche en sauna en de grote villa met 3 patio's met zit- en eettafels bieden elk aan een grote familie of een groep vrienden mogelijk comfort en privacy. Voor kinderen, veel ruimte en er is ook een zwembad voor kinderen. We verwelkomen onze gasten persoonlijk met een welkom-mand, de koelkast is gevuld met de meest belangrijke dingen die bijkeuken is nooit leeg en natuurlijk de wijn niet ontbreken. Zij moeten zich thuis voelen! The accommodation was excellent, with the pool/tennis area absolutely superb. The area was unknown to us before our visit, but we loved the rolling hills, vineyards and hill top villages. Would recommend for a large group or extended family. This is a beautiful place. We stayed here in August with our extended family and had a fantastic time. The weather was glorious and we didn’t go far but then we didn’t have to. 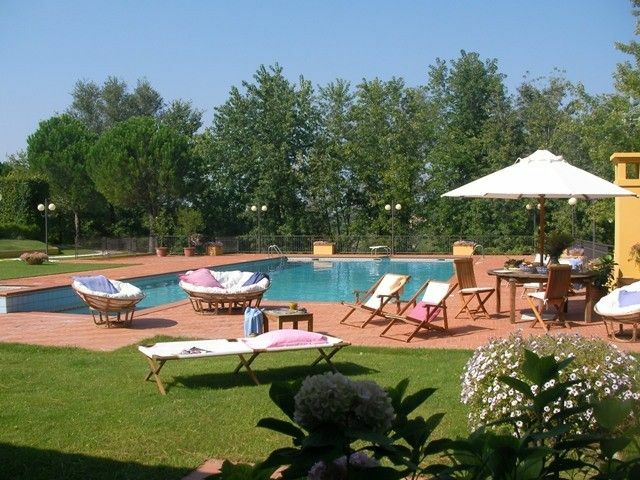 The villa had everything we needed and is a very attractive property indeed. It was exactly as outlined in the entry on this website and no matter how beautiful the property looks in the photos, in reality it is even more attractive. We were very well looked after by our hosts, the brothers Alessandro and Andrea and our maid Kate was a little marvel who kept everything looking just right. They did everything to ensure our holiday was a success right from the first moment we arrived to such a warm welcome. The wonderful swimming pool became the centre of our holiday and the children, ranging from 14 to 4 loved having such a large and well-maintained pool entirely to themselves. The water was very comfortable, the perfect place to cool off, and the views were remarkable. The villa has everything that you need. There are lovely seating areas, very nice bedrooms, all with their own bathrooms (including Jacuzzis) , various terraces for outdoor eating and a good kitchen. The pool house is a fantastic facility. It is a steep walk down to the pool but once you are there you will find a second fully equipped kitchen. It has an oven, a fridge freezer, two sinks, a dishwasher a barbecue and all the pots pans and glasses you could ever need – though we did think that plastic glasses would be useful down there for outdoor living on the pool side. There is also a library a television room, a games room with a full size pool table and a home cinema. I would recommend the villa to anyone looking for a peaceful holiday in beautiful area of Piemonte. It is pastoral, timeless, elegant and it shimmered in the heat. The lovely villages are set amongst a sea of vines and remain entirely untouched. The village of Fontanile itself is dominated by a remarkable church, built in the late nineteenth century after the discovery of a treasure hoard beneath the original building. There is also a bar and a small grocery. Nizza a short distance away will fulfil all your shopping needs. Acqui Terme is a pleasant town too, but it is the villa itself that will make your holiday a success. On our last night Alessandro and Andrea prepared a typical Piemonte meal for us – it was brilliant and a fitting end to a wonderful holiday that all of us, especially the children, will always remember. Wie zu Hause aber noch besser! Wie mieten seit Jahren grosse Villen für unserem Sommerurlaub. Diese war wirklich die absolut Beste. Das Anliegen ist schöner als auf den Fotos, und diese Ruhe! Pool- und Tennisanlage waren von früh bis spät besetzt, man hat hier alles was man braucht. Die Gegend ist traumhaft, kein Massentourismus, tolles Essen und Wein, Italien PUR. Alles war höher als die Erwartung. Wir kommen wieder, dieses Mal 2 Wochen. Elk seizoen heeft zijn charme in deze betoverende regio van Monferrato. Niet zo druk en chaotisch als andere regio's van Italië kunnen ze genieten van een vakantie zonder massa's toeristen hier. Er is altijd genoeg te doen, maar de meeste van onze gasten thuis blijven, ontspannen en verwend te worden door ons.